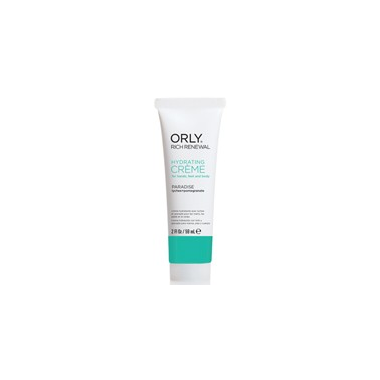 Nourish skin and promote healing with Orly's Rich Renewal Hydrating Cream, a non-greasy formula containing Shea and Cocoa Butters. Aloe Vera and Vitamin A & E condition and help protect skin against harsh environmental factors. Ingredients: Water, Cetearyl Alcoho, Polysorbate 60, Isopropyl Myristate, Caprylic/capric Trigyceride, Stearic Acid, Glycerin, Carthamus Tinctoris(Safflower) seed Oil, Propylene Glycol, Butyrospermum Parkii(Shea) Butter,Theobroma Cacao(Cocoa0 Seed Butter, Olea Europaea(Olive) Fruit Oil, Tocopheryl Acetate, Retinyl Palmitate, Aloe Barbadensis Leaf Extract, Vanilla Planifolia Fruit Extract, Camellia Sinensis(White Tea) Leaf Extract, Parfume, Carbomer, Dimethicone, Triethanolamine, Cl 19140(Yellow 5), Methlyparabem, Butylparaben, Isobutylparaben, Ethylparaben, Propylparaben, Phenoxyethanol, Benzyl Benzoate, Benzyl Salicylate, Coumarin.